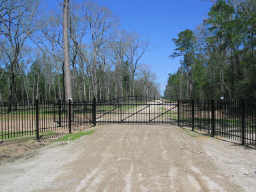 Country Living on 11 acres centrally located between Magnolia, Conroe and The Woodlands. This private, gated subdivision has beautiful trees with rolling terrain. Light restrictions will preserve the value in this most desirable neighborhood. This property is ideal for a Cattle Ranch, Horse Farm, or Leisure Ranch. Take a drive out to the country, you will not be disappointed.